This flower pot trellis tutorial is a fun way to create elegant looking planters with the use of standard tomato cages. When we replaced our double front door with a single door, I knew that I would want to place flanking pots on the porch. I used to have a large black planter that sat to the left, and that just doesn’t work with the new door. I think I’ll place the old planter in the garden where our maple tree used to be. The two pots that I used in the garden for the color wheel post are now used to flank the front door. To give them extra pizzazz and height I created a flower pot trellis to set on top of the pots. To make the trellis purchase a standard tomato cage and flip it upside down. I painted the cages and the pots black to tie them all together. Next I used these baluster knuckles, normally used to decorate metal stair legs, to cap the top of the cage like a finial. I did use a rubber band to hold the legs together first, but I’m not sure it was necessary. The one problem I had was the size of the pot, compared to the diameter of the lowest ring. They were just about the same. It would have been better if the pot was a tad bigger, or the cage a little smaller. Either way I would have used something to stake the ring into the pot like these plant label stakes . They kept the cage firmly in place. You could use a heavy gauge wire and make your own stakes. Sticking with my purple and green theme for the year, I planted sweet potato vine, lobelia, and callibroachia trailing around the sides. Note: Add the plants to the pot before attaching the trellis. The star of the planter, though small for now, is a black-eyed susan vine placed in the back. I used the twist tie that came with the plant to attach it to one of the sides of the trellis. 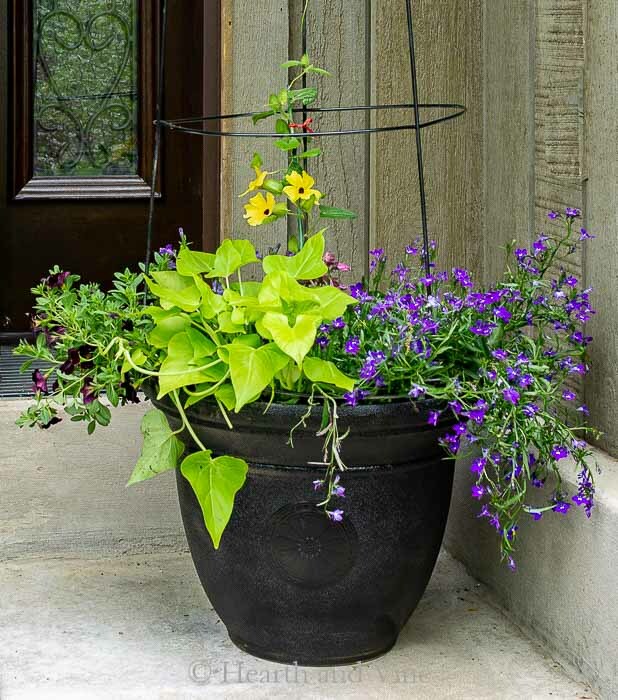 I know from experience that this pretty flowering vine is a vigorous grower, and will shine in this planter. I’m seeing more and more of this vine in the nurseries this year. The yellow is pretty standard, but it also comes in a white, peach and pink. The next day the vine already attached itself to the trellis and started growing. I’m loving the vibrant color of our entrance this year. I can’t wait to see what it will look like with everything grows in. 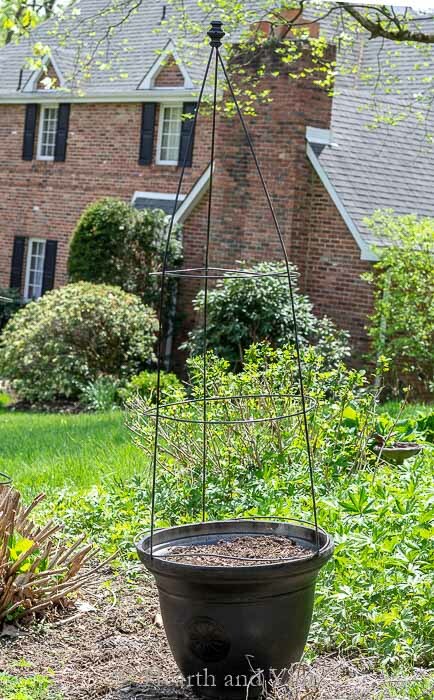 This is a neat idea and depending on the material of that pot you could probably drill holes in the rim (Use a glass cutter bit if it’s a clay pot) and then thread wire through attach to the T/cage and secure with the wire. String would probably also work but wire wouldn’t rot. Like floral wire because it would be almost invisible. Great project and that front porch is is beautiful. I love that you can always see new and different ways to tackle a project. Thanks for sharing.